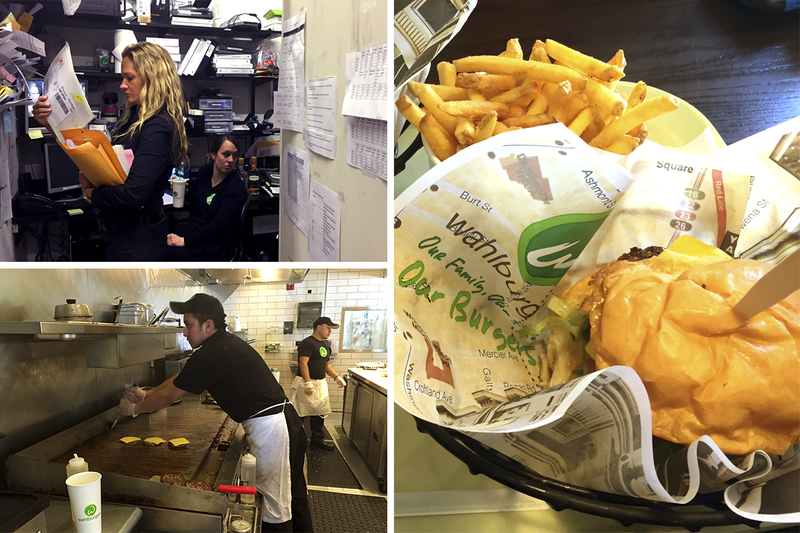 Mark Wahlberg is likely the human incarnation of the phrase ‘over the top,’ but the Wahlburgers’ corporate offices in Hingham are, by all means, regular offices. I’m pleasantly surprised to discover this when I stroll into the building on an unusually sunny day in early March, but more so because the space is incredibly homey. A bright living area with cozy couches and coffee tables, the room is filled with all sorts of authentic Wahlberg memorabilia. 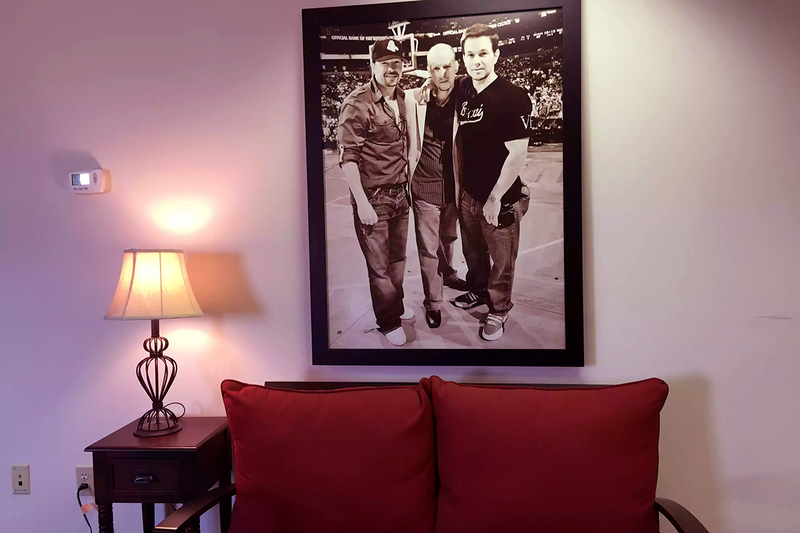 A white wooden plank hangs on the reception desk that says “Meet Me at Wahlburgers,” and on the wall adjacent is a poster-size photo of Donnie and Mark with their brother Jim. Other local awards and movie posters surround the room, perched on top of tables. Kari Burke, dubbed as Paul Wahlberg’s “assistant” on A&E’s Wahlburgers, greets me with a huge handshake, and leads me further into the room. She’s donned in all black, has a thick mane of curly blond hair, and carries a Starbucks drink in her hand. I immediately think she’s great. 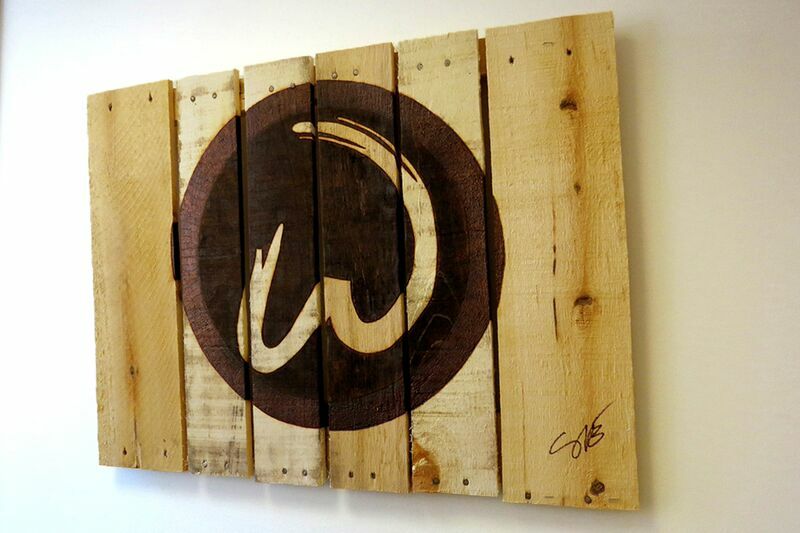 Kari points to a wooden sculpture hanging outside of her office with the Wahlburgers logo branded on it in black. “A fan made this one,” Kari says. It looks something original or handcrafted. “As you can see, we’re really small here,” she says. The space, located right across the freeway from the plaza that homes Wahlburgers and Alma Nove—the first Wahlberg-owned restaurant, a signature Italian-Mediterranean place named after Wahlberg supermom Alma—is utilized by just three people: mastermind behind the Wahlburgers restaurant Paul Wahlberg, Wahlburgers and Alma Nove CEO Rick Vanzura, and Kari. She mentions that Wahlberg and Vanzura are looking to enlarge the office years to come, hoping to knock down a few walls for expansion. 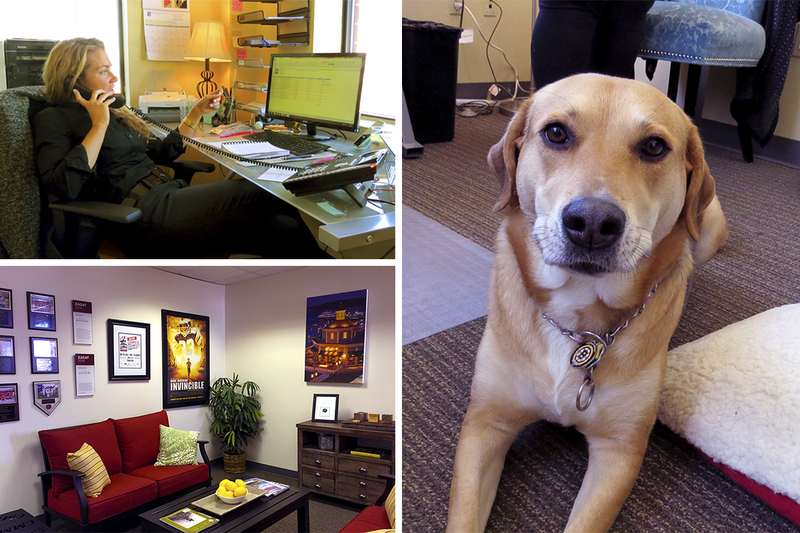 “They’re saying we’d have 14 to 16 employees in the office two-to-three years from now,” Kari explains when we sit down in her office. Kari’s dog Maggie, a mixed-breed pooch, is perched in her dog bed underneath a table. “What exactly is your job title?” I interrupt. The phone rings briefly, and Kari excuses herself. “Hi it’s Kari, calling from…a couple of different places.” She’s undoubtedly not just the Wahlburgers girl. We drive on over to the restaurants within a few hours. Alma Nove and Wahlburgers are located within feet of each other right on the waterfront at Hingham Shipyard. 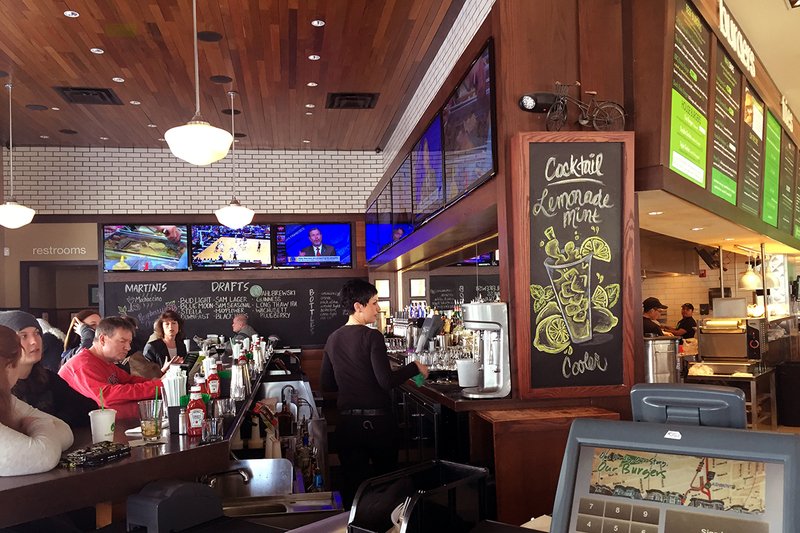 We pop into Alma Nove briefly, when, at one in the afternoon on a weekday, it’s pretty quiet. Alma herself used to work at the restaurant as a hostess three days a week before Wahlburgers ever aired. Between filming on-site and doing interview segments about 30 to 40 hours a week, she put her duties at Alma Nove on hiatus. And, only naturally, when the show aired everyone fell in love with the endearing and spunky mothah from Dorchestah. As Kari turns her attention to some tasks in the kitchen, I sit in a plush waiting area in the front of the restaurant with Alma and her grandson Brandon. Donnie looks a lot like her, the same eyes and smile. The show doesn’t deceive; Alma Wahlberg is a captivating human. Have you seen her laugh? It’s like a thousand rainbows erupt from the skies at the sound of each hearty giggle. “Kari stands out a lot,” Alma notes to me. “She is probably one of the smartest people I know, and very hardworking. She’s constant. Seven days a week.” Somehow, that doesn’t surprise me. Brandon Wahlberg also appears on Wahlburgers and looks nothing less than Mark Wahlberg 2.0. He’s 25, husky, and has a thick Boston accent unlike anyone else I’ve encountered outside of the realms of actors on The Departed. I also understand how he suddenly found a massive female Twitter following almost over night. A larger group of people are sitting in the waiting area, too, and Paul Wahlberg emerges from the kitchen in his usual white chef’s attire and Wahlburgers cap. The older woman in the group says that she’s with her family, and traveled all the way from Maine to see his restaurant. She gushes over how great his businesses are, noting that she and her family are huge fans of the show. “You’re so kind,” Wahlberg says to them so politely. So after our Alma Nove pit stop, we scurry over to Wahlburgers where Kari picks up some files in a manager’s office. This is the restaurant I’m familiar with, having visited Wahlburgers before, and also because a large percentage of the show is takes place here. The real glorious piece of interior at Wahlburgers, that is perhaps not really discovered on the TV show, is part of the ceiling, a big stainless steal-esque piece that’s collaged with Wahlberg movie and TV show titles. As a culture fanatic, it’s really neat. On that subject, I ask how often Donnie and Mark come around town to shoot Wahlburgers, but Kari explains that between the Wahlberg brothers, the routine often revolves around their schedules. “Mark is not only west coast, but he’s usually always filming a movie,” she says, pointing out many of his scenes are shot in California. “Donnie comes up quite a bit because he’s east coast. That episode when he took over the restaurant for a day? He really took over the restaurant.” Ah, of course. An iconic episode, for many. Over burgers (I chose the standard burger, a.k.a. 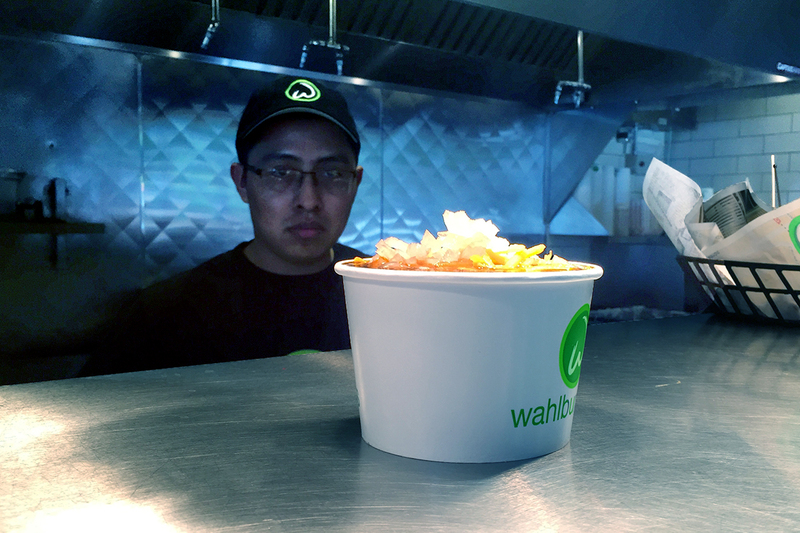 ‘Paul’s Choice,’ not because I’m plain, but because I’m rather fond of the simplicity of a straightforward cheeseburger) we talk briefly about the future of Wahlburgers. How long this be on the air on for? How does Kari see herself developing of not so much a character, but a “personality”? It can’t be easy knowing her job isn’t necessarily portrayed the way that it actually is. She seems invested, however, mentioning that they’ll pick up shooting season three in the next few weeks. “So it’s worth it?” I ask.